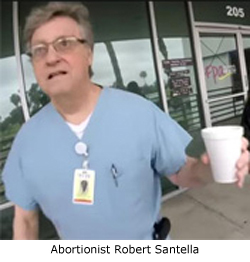 San Diego, CA – Abortionist Robert J. Santella, who was featured on a viral video as he hissed and threatened a pro-life activist with scissors while admitting he had a “darkened heart,” has been fired from his job at FPA Women’s Health (formerly Family Planning Associates), the San Diego abortion facility where the incident took place. Operation Rescue confirmed that Santella is no longer employed there. As previously reported by Operation Rescue, just days after the incident in which Santella wore an identification badge from Sharp Healthcare, the hospital group terminated all affiliations with him. However, Santella continues his abortion business at his long-time private practice in the College area near San Diego State University. As a repeat offender with questionable patient care practices that date back decades, Santella faces the very real possibility of license revocation. In the 1983, the California Medical Board suspended Santella’s medical license for 60 days and placed him on probation for five years after it found him guilty of gross negligence and incompetence in the treatment of three patients. In 2000, Santella’s medical license was revoked for failing to maintain adequate medical records. That revocation was stayed and Santella served four years on probation. Operation Rescue has also acquired records that show Santella has a documented history of disciplinary actions and medical malpractice. Recently obtained court records show that a medical malpractice complaint was filed against Santella in 2011 by Jaqueline Thompson-Dunn, a woman who went to him for the surgical removal of an ovary at Promise Hospital in San Diego, a facility that specializes in long-term medical care for serious illnesses. According to the court records, sometime during the surgery, Santella punctured Ms. Thompson-Dunn’s bowel twice. Once he realized what had happened, he called for a general surgeon to repair the punctures. For reasons unknown, no general surgeon could be located “in the hospital, on call, or anywhere in the county” to repair the damage, according to the suit. Finally, Santella attempted to repair the bowel damage himself. Six days later, Thompson-Dunn was discharged from the hospital. Two days after her release, Thompson-Dunn reported to another San Diego County hospital complaining of severe abdominal pain. Thompson-Dunn indicated that she suffered long-term health issues since Santella conducted her surgery, including chronic bowel dysfunction. The malpractice suit was dismissed the next year at the request of both parties. This usually indicates that an out-of-court settlement was reached. Since then, at least two ambulances have been observed transporting Santella’s abortion patients from the FPA office, now located on Mira Mar Road. Santella’s firing from FPA ends a relationship with the California abortion chain that dated back nearly 30 years. Early in their business relationship, Santella provided emergency hospital care for FPA abortion patients who suffered serious complications from their procedures. Santella was hired on at FPA full time in the early 2000s after two previous abortionists quit or refused to work any longer at the San Diego office. One of FPA’s full-time abortionists, Karl Seligman, suddenly quit in 1993, due to encouragement from pro-life supporters. His successor James M. Long, also quit the San Diego location due to pro-life protests, and was reassigned within the FPA organization. At one point, Santella stopped offering abortions at his private practice, but with his recent termination with FPA, he has resumed his abortion business there.